How can we make sure tomorrow’s jobs are better than today’s? We need to Expect More. We have the opportunity to shape the future by investing now in the right advanced-skills training and education. Find out what Arkansas's 70/30 equation is. 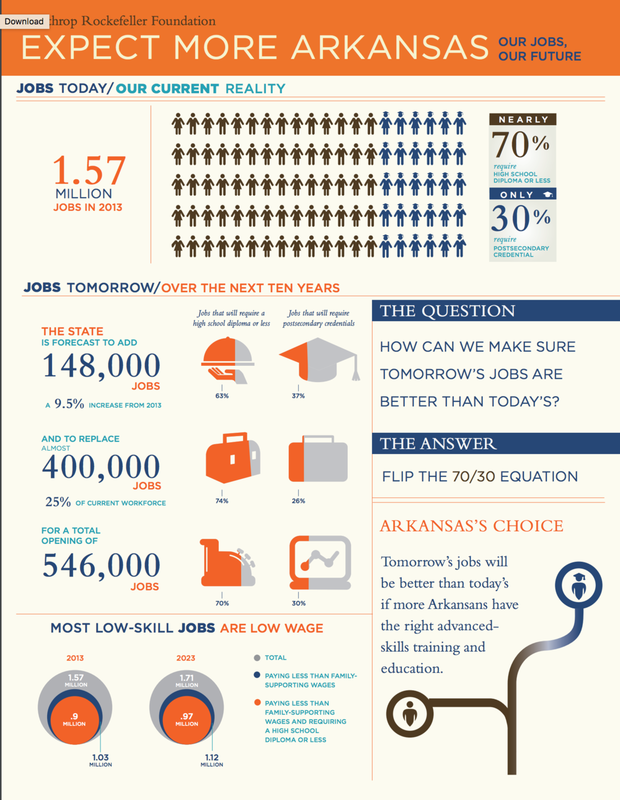 How can we make sure tomorrow's jobs in Arkansas are better than today's? Tomorrow's jobs will be better than today's if more Arkansans have the right advanced-skills training and education. The Southern Arkansas Regional Alliance (SARA) between National Park College, College of the Ouachitas, and Henderson State University shows us how colleges and universities can form partnerships to help more residents obtain the education required to start high-skilled jobs that pay family-supporting wages. Be Pro Be Proud is an example of how business leaders across the state are demanding change to prepare students for in-demand jobs that pay higher wages. The Career Pathways Initiative shows us how private and public resources can create change in communities by reducing financial barriers to education and future career success. Project Future Story shows what a community can accomplish when community leaders, businesses, and education institutions form partnerships to increase college attendance, retention, and graduation. Pea Ridge Manufacturing and Business Academy (PRMBA) shows us how business and education leaders can form partnerships to prepare students to meet communities' workforce needs. Almost Qualified shows us that Arkansas can Expect More when businesses form strong partnerships with educational institutions and nonprofit organizations to build our state’s workforce pipeline. Expect More Arkansas is an initiative of the Winthrop Rockefeller Foundation (WRF). For more than 40 years, WRF has helped to build and sustain the organizations that serve and strengthen Arkansas. Through grantmaking and strategic partnerships, WRF is working hard to help close the economic and educational gaps that leave too many Arkansas families in persistent poverty.